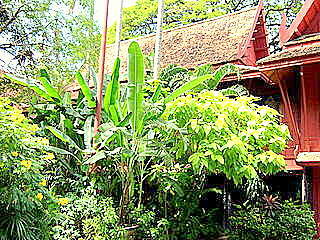 The Jim Thompson House is a beautiful traditional Thai house standing at the end of a quiet soi by the Saan Saab Canal. The canal dug in the reign of King Rama III starts from the old city to the west and flows across the city to the outskirts to the east. The house consists of six authentic Thai houses interconnected seamlessly to appear as a large elevated house set in a lush garden. Please see map to the house. The legend of Jim Thompson the man responsible for this masterpiece merits a separate page. The houses are designed broader at the base and tapering to the top. The same feature is manifested in the doors and windows. This tapered structure adds to the stability of the house and also to ventilation, as cool air is drawn in and hot air channeled upwards and out through the vents at the top of the walls. No nails were used, only wooden joints and pegs, a standard feature in the traditional Thai house. Some of the houses were acquired from as far as Ayudhya and transported to Bangkok. The house making up the living room is 175 years old, the oldest house and the other houses are 75 – 150 years old. These houses were skilfully reassembled by Thai craftsmen in the traditional Thai architecture and décor. The construction of this masterpiece took 11 months to complete. 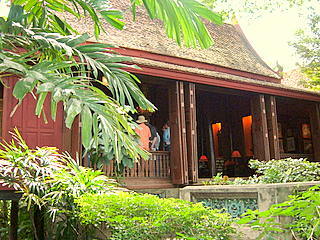 The Jim Thompson House was officially occupied on 3 Apr 1959. In keeping with Thai tradition, the date was chosen after careful consultation with astrologers. The astrological card with this date is pasted on the wall of Jim Thompson's study. Another card indicating his birth date is pasted to the right. Perhaps the signs on this card were not as propitious. A luxuriant Thai garden weaves its way around the house, making it virtually a jungle maze. Jim Thompson fondly referred to the garden in his house as the "jungle." The thick foliage interspersed between the wings of the house, almost obscures parts of the house from view, giving the place a cool and peaceful atmosphere. The terrace fronting the main house overlooks the boat landing which is shaded by a 100-year-old tree. Beyond the garden wall, the busy riverboats flow along the Saan Saab all day long taking people to work or school and back. 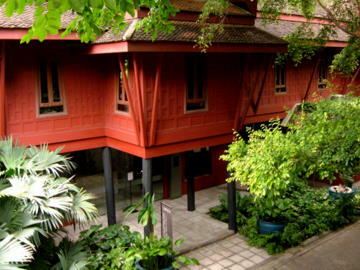 The Jim Thompson House is a repository of antiques and Thai handicraft. Buddha statues ranging from 8th to 13th and 14th centuries, Chinese ceramics, Thai paintings and other antiques can be seen on display in almost every room and recess in the house. Upstairs in the room that used to be the kitchen is an exquisite collection of 19th century Chinese ceramics. This form of ceramics later developed into the renowned Benjarong porcelain, made with the five primary colours, black, white, red, blue (or green) and yellow. Benjarong in Thai, is the collective name for porcelain in these five colours. Ban Krua a community of Cham Muslims who were Thai silk weavers lived along the Saen Saab. Thompson convinced these weavers to produce the first Thai silk samples to start his business. He also built the Jim Thompson House on the Saen Saab opposite this community. Ban Krua is still there today. Besides his house, Jim Thompson is best known for bringing hand woven Thai silk to the fashion capitals of the world. For visitors to Bangkok, his name is synonymous with Thai silk. Please see Jim Thompson outlets in Bangkok and the Jim Thompson Farm. 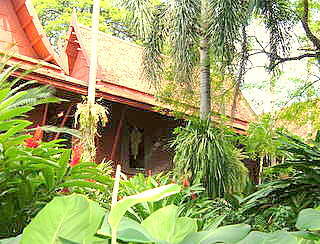 To visit the official web site of the Jim Thompson House, click on this link. 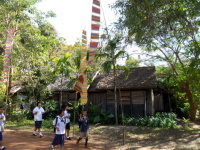 Jim Thompson lived in this house for eight years during which it was the center of social activity. Unfortunately, in 1967, he disappeared mysteriously during a holiday in the Cameron Highlands, Malaysia. All efforts to find him were in vain. 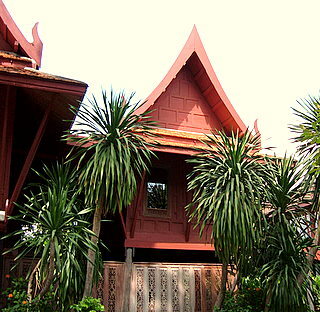 But the Jim Thompson House remains a legacy of Thai architecture and handicraft. The address of the house is 6 Soi Kasemsan 2, off Rama I Road. It is right at the end of the soi about 250 m from the main road. The Saan Saab Canal is just behind the house. There's also a Jim Thompson Thai silk outlet, the Thompson Bar and Restaurant and an art gallery within the premises where you can buy your souvenirs or enjoy a meal and refreshments. The Jim Thompson House is open to the public everyday from 9:00 am – 5:00 pm. Entrance fee is 100 baht. Guided tours are conducted in English, Japanese and Thai. The fastest way to get there is to take the Bangkok skytrain to the W1 National Stadium station, the terminal station of the Silom line, which is 200 m away from Soi Kasemsan 2. If you are using the Sukhumvit line, you have to get off at the Siam interchange then take the Silom line to the National Museum. If you don’t mind the walk, the Siam interchange station is about 800 m to the Jim Thompson House. As the place is well served by the skytrain which is fast and convenient, it won’t be worth your while to take a taxi or bus. Just avoid the skytrain during the office rush hour in the morning (until 9 am) and evening (from 5 pm onwards). While you are there, visit the Thai silk weavers of Ban Krua. This was the community of Cham Muslims who lived across the San Saab canal from the Jim Thompson House. They were weaving silk for Thompson in the early days. Just walk till the end of Soi Kasemsan to the banks of the canal. Turn left and follow the path running along the canal bank. Cross over the bridge to Ban Krua.